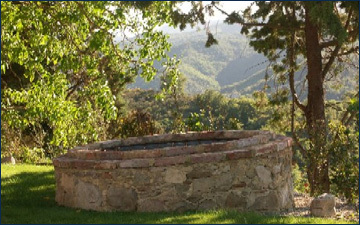 The house stands in the centre of 2.5 acres of gardens and is surrounded by open land - providing plenty of private space to relax, admire the beautiful italian countryside and for children to run around all day. 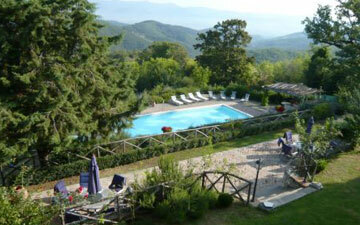 The grounds incorporate a large swimming pool, terraces and charming covered outside dining area (Gallery Pic 4). The secluded pool measures 7m x 15m (23 ft x 50 ft) and benefits from an outdoor shower, a built in drinks fridge, pool volleyball and a pergola for shade. This area is bathed in sunshine throughout the day and in the evening is perfect for enjoying the spectacular sunsets. 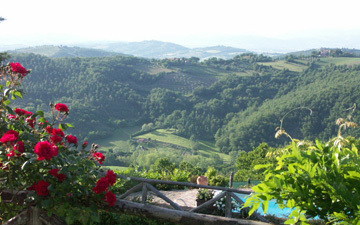 The Villa's grounds include gardens, terraces and lawns surround the building with breathtaking views in all directions. The building to the left is the (untouched) tobacco tower (where the tobacco crop used to be dried) which also contains a large bread oven. The building to the right of the house is the Loggia, now an outside dining area with a large dining table, professional catering barbeque and it’s own terrace. The giant outdoor chess is set beside the Loggia in the midst of a box maze. Behind the house lies an impressive 20metre terrace of stone and terracotta tiles and is reached by an elegant sweeping stone staircase. This overlooks the gated pool area which is the ideal place to take in the breathtaking views across the Tuscan countryside. 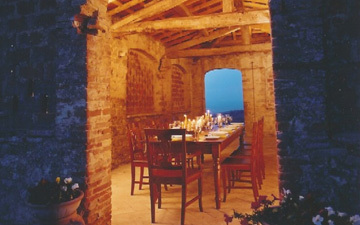 In 2004 Palazzo Prugnoli was painstakingly restored as we undertook our own personal 'Grand Designs' project. The policy for restoration was to keep and reclaim as much of the original materials so that its character was retained throughout. This has been achieved by the use of local craftsmen and artisans many of whom took particular interest in the project as their fathers and forefathers had lived and worked at the house. In depth research was carried out prior to commencement of the refurbishment and a hands-on approach was taken by the owners to achieve the desired result. The outside has also been kept as close to the original as possible. The roof has been completely renovated and the original terracotta tiles reused. Many of the doors have been restored and those remaining were made to the original design by local carpenters. 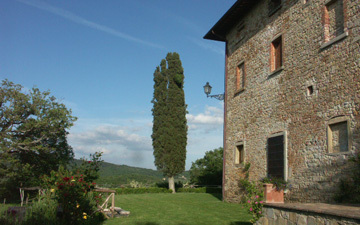 The result is house that has kept all the character and charm of a traditional italian villa but ready to welcome guests looking for a large Tuscan holiday villa.